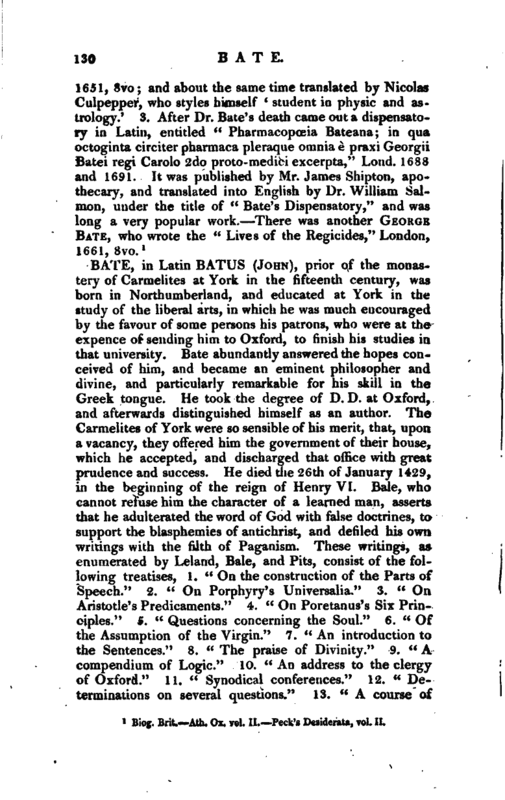 , an eminent physician, was born at Maid’s Morton near Buckingham, 160S. At fourteen years of age he became one of the clerks of New college, in Oxford; from whence he was removed to Queen’s college, and afterwards to St. Edmund’s hall. 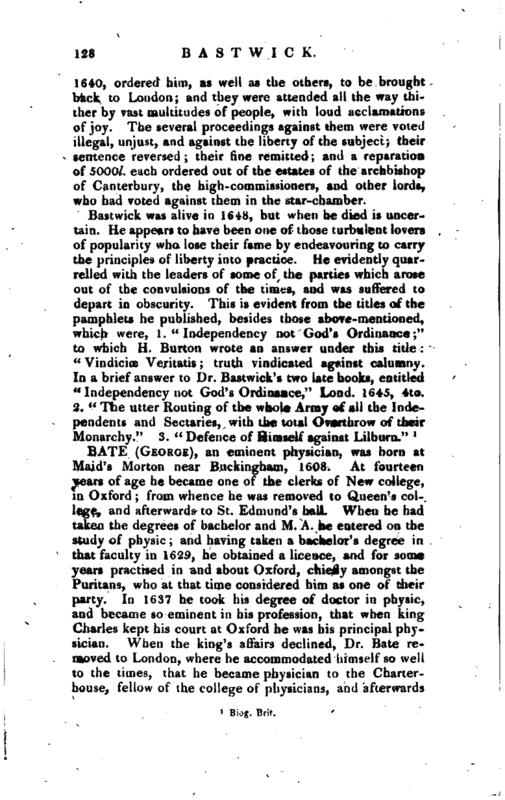 When he had taken the degrees of bachelor and M. A. he entered on the study of physic; and having taken a bachelor’s degree in that faculty in 1629, he obtained a licence, and for some years practised in and about Oxford, chiefly amongst the Puritans, who at that time considered him as one of their party. In 1637 he took his degree of doctor in physic, and became so eminent in his profession, that when king Charles kept his court at Oxford, he was his principal physician. When the king’s affairs declined, Dr. Bate removed to London, where he accommodated himself so well to the times, that he became physician to the Charterhouse, fellow of the college of physicians, and afterwards | principal physician to Oliver Cromwell, whom he is said to have highly flattered. 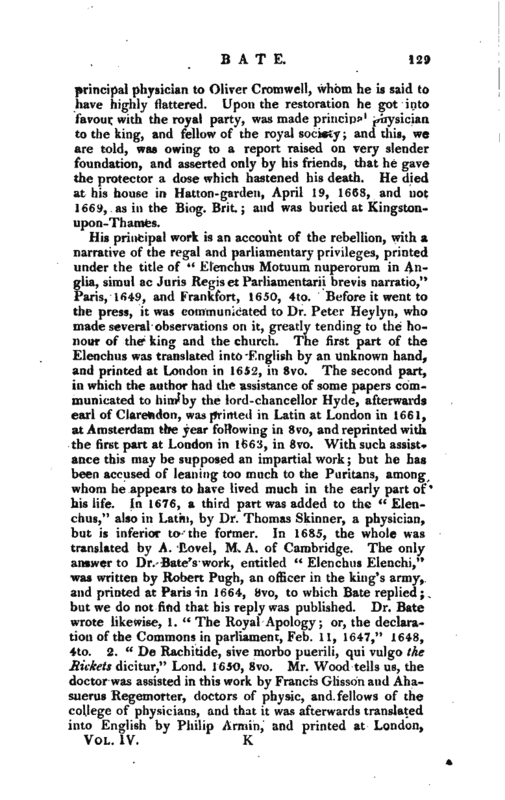 Upon the restoration he got into favour with the royal parly, was made principal physician to the king, and fellow of the royal society; and this, we are told, was owing to a report raised on very slender foundation, and asserted only by his friends, that he gave the protector a dose which hastened his death. He died at his house in Hatton-garden, April 19, 1668, and not 1669, as in the Biog. Brit. and was buried at Kingstonupon-Thames. 1 Bio. Brit. —Ath. Ox, vol. II. Peck’s Desiderata, vol. II.